More photos available on request. 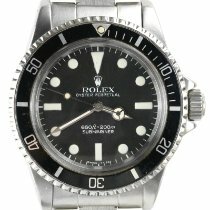 Please see calibre-co.com for high definition photos and videos of this watch. The Rolex Daytona "Red Sultan" Cosmograph is widely considered one of the most collectable and sought-after watches in the world, with a recent example stealing the show at a 2018 "Daytona Ultimatum" auction in Geneva. Made on special request by His Majesty Qaboos bin Said Al Said, the Sultan of Oman, it is thought that fewer than 15 were ever produced. This watch comes steeped in provenance and is being brought to market for the first time on behalf of the original owner. The owner spent over 30 years in the British armed forces with more than 20 in the RAF, including operational tours in the Middle, Far East and East Africa. He served multiple tours in Oman serving the Omani military and royal family. 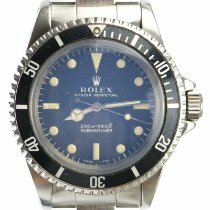 The watch was presented for services rendered in 1978 and the original invitation from the Sultan to the ceremony of presentation is still present and available with the watch. Additional documents and related items are also available on request with the watch including photos and documents that have been retained such as SOAF cap pins and shoulder boards. The watch itself is in excellent condition. The dial is immaculate with a deep chalky black contrasting sharply with the vibrant red of the "Khanjar" logo. 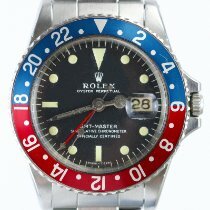 It is notable that the "Rolex Oyster" text has been moved higher and the "Cosmograph" text lowered to just above the bottom register to allow space for the substantial logo. The caseback is stamped "Asprey" who originally managed the special order and delivered the watches to the Sultan. Also of note is the presence of an additional hole, near the edge of the case (under the caseback), this hole was used by Rolex to secure the back in place to complete the engraving. Oman has a long shared history with Great Britain. In 1798, the two states signed a Treaty of Friendship under which Britain guaranteed the Sultan’s rule. A succession crisis in 1856 saw the Omani Empire divided into the Sultanate of Oman and Muscat and the Sultanate of Zanzibar, and in 1891 Oman and Muscat became a British Protectorate. For much of this period, the Sultan controlled the coast around Muscat while the Imam governed the interior from Nizwa. Oman achieved independence from Britain in 1951, whilst retaining strong links. In 1962 civil war broke out in Oman leading Sultan Said bin Taimur to enter the Dhofar War, which would last until 1976. During the Rebellion, a bloodless coup d’etat took place, with the Sultan being overthrown by his son Qaboos bin Said Al Said. The new Sultan is widely believed to have been backed in his move by the British, and a strong link was formed between the countries’ armed forces. This was true of the Air Forces, and the British continued to provide ongoing pilot training to the Sultan of Oman's Air Force (SOAF) – later renamed the Royal Air Force of Oman (RAFO). The new Sultan made a rare habit of gifting commissioned watches as a special thanks of service to pilots and armed serviceman throughout this period, with the majority of these being commissioned from Rolex through Aspreys of London. The ‘Khanjar’ logo of the SOAF featuring two swords and a khanjar knife has become revered in watch collecting circles for its beauty and rarity. It can be found featured on a range of reference numbers from this period, with the most desirable being the 6263 Rolex Daytona Cosmograph. Interestingly this model proved very unpopular when first released, perhaps explaining its modern rarity and why it is widely considered to be the most collectable reference ever produced. Interested buyers are requested to get in touch directly, either by email or directly by phone. All watches are kept off site and viewings are not open to the public.